Bee learning activities for kids. The 10 bee learning activities on this page are just the tip of the iceberg when it comes to teaching kids about bees. When it comes bees and teaching kids, you’re limited only by your imagination. There are a number of reasons why teaching kids about bees is important. First of all, teaching kids about bees helps kids be better people when they grow up—people who have respect for nature and who are willing to do things to protect it. Teaching kids about bees also helps kids understand some very basic elements of science. It also helps them learn about the larger environment of which we are all a part. Finally, teaching kids about bees can be fun! What could be more fun, for instance, than dressing up like bees for Halloween?! See below for some fun bee learning activities to help you teach kids about bees. Here are 10 facts and related bee learning activities to help you get started. Have fun! Bee fact: At least one out of every three bites of food we eat is made possible because of the pollination services provided by bees. Bee learning activity: Ask children at meal time to tell you if the food they’re eating was made possible by bees. Keep in mind that bees pollinate many of the foods that animals eat, so many of the meats we eat are also made possible by bees. Bee fact: Bees are our friends, and we should treat them with the respect and care they deserve. Bee learning activity: Read books to young children, that help them understand that bees are our friends. 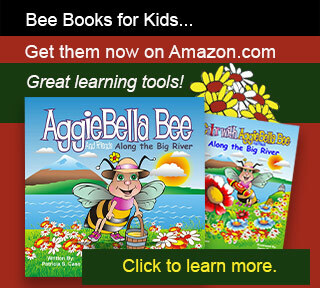 One great book to get is titled AggieBella Bee and Friends: Along the Big River. Bee fact: Mason bees are a type of “native” bee that live in tubular holes in trees. Some gardeners attract native mason bees by building them their own houses. Bee learning activity: Find out who in your area sells mason bee houses, or learn to make one yourself. Share your experience with your child, and learn how to become a mason bee beekeeper. Bee fact: All bees do not look alike. In fact, there are roughly 24,000 species of bees worldwide! And when you look closely, you can see some big differences. Bee learning activity: The next time you have an arts and crafts activity with kids, make it one having to do with how different types of bees look. For instance, have your kids use face paints to color their faces according to how a bee might look. Bee fact: There are seven different species of honey bee. The European or Western honey bee is the type of bee that beekeepers keep in beehives. Bee learning activity: Take children on a field trip to a local apiary, and ask the beekeeper to tell children about the type of work he or she does with bees. Bee fact: People often mistake yellow jackets and wasps for bees. Yellow jackets and wasps are far more likely to sting than bees, and when they do, it often hurts much more. Bee learning activity: Find pictures that show what wasps and yellow jackets look like, and compare them with pictures of different types of bees. Bee fact: Bees evolved from wasps about 100 million years ago, when dinosaurs roamed the earth. Bees became vegetarians, while wasps remained meat eaters. Bee learning activity: If your children are into learning about dinosaurs, be sure to ask them what they think may have happened to bees when dinosaurs went extinct (about 65 million years ago). Bee fact: For the most part, bees only sting people if they think they’re being threatened. The best way to avoid bee stings is to avoid getting in the way of the activities of a bee. Bee learning activity: The next time you’re in a garden when flowers are in bloom, look closely at the flowers to see if you can see bees working them. Don’t get too close though, as bees may feel threatened by your presence. Bee fact: Different people react differently to bee stings. Most bee stings do not cause serious problems, but in rare cases, bee stings can be fatal. Bee learning activity: Ask older children to read-up on honey bees and how they might sting people, and to give a report in to their class on what people should do if they get stung by a bee. Bee fact: Pesticides are a major cause of bees dying, and need to be used (if at all) with great care. Bee learning activity:Ask your children to help you plant some flowers in the garden. And when you do, tell them that you’re not going to spray anything on the flowers that might make the bees sick. If you do spray anything, show children that you’re reading the labels to be sure there’s nothing in the spray that will hurt bees. We invite you to read more about bee learning activities for kids, by visiting other pages on this site, and by visiting the other links to bee learning activities listed below.